In the caves and rock shelters of the Dordogne region of France, Alan Alda witnesses the spectacular paintings and carvings that date back some 30,000 years, artwork that archeologists once thought to be the first record of people with minds like our own. When this art was created, Europe had already been peopled for hundreds of thousands of years – and thousands of lifetimes – by humans we call Neanderthals. Alan discovers, from visits to sites where Neanderthals once lived, that Neanderthals were tenacious and resourceful. But they appear to have lived in and of the moment; certainly they produced no art, and employed a stone tool technology that changed little over millennia. The people who painted the caves, our ancestors, were strikingly different, possessed of what we are calling the Human Spark, capable not only of art but of innovative technology and symbolic communication. The questions Alan explores: Where and when did the Human Spark first ignite? In these caves, as archeologists have long believed? Or at a much earlier time – and on another continent? 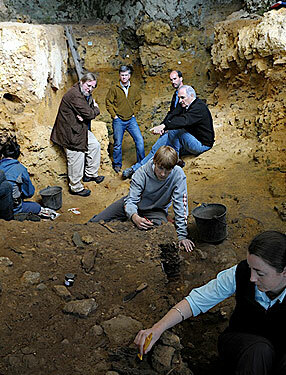 Finding the answer involves scanning Neanderthal teeth in a giant particle accelerator to learn about their childhood; reading Neanderthal’s genetic code in DNA extracted from 50,000 year-old bones; and discovering and reconstructing the weaponry that made possible – and relatively safe – the hunting of large animals in East Africa. We will also unearth the beads that are the first evidence of our species’ fascination with social status – and a powerful new means of long-distance communication; recover from the teeth and bones of both Neanderthals and our ancestors evidence of what they ate; and explore the Great Rift Valley in East Africa with archeologists who believe that it was there that the Human Spark first began to glimmer, tens of thousands of years before it burst into flame in Europe. The program is full of vigorously argued controversy, great characters with great passions, and of course the inimitable curiosity and humor of Alan Alda.